Hybrid cars are good for us, right? So policymakers should provide incentives--things like tax breaks, access to HOV lanes, and free parking for hybrid drivers. Well, not so fast, says a great article in today's Washington Post. [Free registration req'd.] There's growing reason to believe that those incentives for hybrids will make things worse--actually generating more gasoline use, not less. That's because many of the incentives confuse the means for the end. Reducing fuel use (and attendant ghg emissions, air pollution, etc.) is the goal; getting drivers into hybrids is simply one instrument in pursuit of that goal. An incentive -- whether it's access to a carpool lane or cut-rate financing -- still aims to put another car on the road, and that undermines efforts to encourage carpooling. Giving over HOV lanes to hybrids is probably counterproductive. In Virginia, where allowing hybrids in HOV lanes was pioneered, officials are worried that solo drivers in hybrids are clogging the high-capacity lanes and thereby discouraging carpools (because carpooling is no longer any faster than driving alone). In fact, 25 percent of all Virginia HOV lane users are hybrid drivers. And despite their hype, hybrids are not so fuel efficient that they can offset the fuel efficiency of an ordinary car with two or three riders. So the fuel efficiency of Virginia hybrids may become illusory as the vehicle fleet actually consumes more gas because drivers give up carpooling. Same goes for other popular incentives: tax breaks and free or reduced-price parking. These incentives encourage people to drive by making it cheaper. And if some incentives are wrong-headed, it's because they seem to miss the reason why hybrids are good in the first place. If we want to reduce fuel use, it's hard to see why hybrids deserve special tax breaks that are not afforded to buyers of other fuel efficient gas-powered cars (some of which are actually more efficient than certain hybrids). What's so special about hybrids? But wait! Incentives catalyze the market. That's the basic argument for hybrid-centric policies. The idea is that by encouraging people to get into hybrids now, we'll reduce fossil fuel consumption down the road, when hybrid cars become cost-competitive. There's some merit to this line of reasoning, but it's starting to seem outdated. 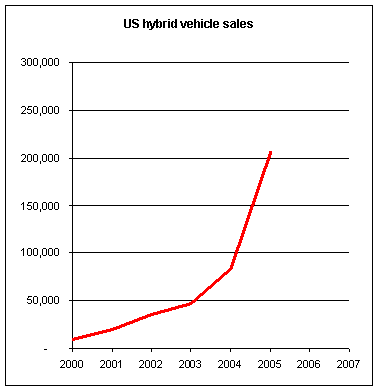 The market for hybrids is scorching hot and growing--it probably doesn't need to an additional catalyst. 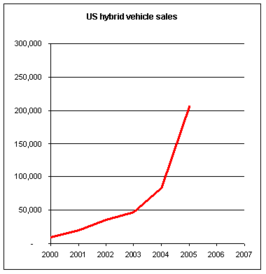 Hybrid sales in 2005 were 10 times higher than in 2001 (and 20 times higher than 2000) and the growth looks set to continue. Incentives are probably a contributing factor, but high fuel prices are probably a much bigger reason. The bottom line is that there's nothing especially laudatory about hybrid cars in and of themselves. The only thing special about them is that--generally speaking--they burn less gas per mile than internal combustion cars. But as the hybrid market diversifies into SUV and Lexus flavors, there's increasingly less reason to lionize hybrids per se. What really matters is fuel efficiency--plain old unsexy fuel efficiency, whether the car runs on gas, electricity, LNG, switch grass, or tiny elves. I'm not saying that all incentives should disappear, but the incentives should be for fuel efficiency, plain and simple. It doesn't do much good to encourage buying a hybrid Ford Escape when a vanilla Civic is far more eco-credible. Efficient hybrids will still benefit, as will other fuel-sipping cars--just the kind we want on the road. And there's an asterisk here too: the incentives shouldn't conflict with other instruments to reduce fuel use. Allowing solo drivers into carpool lanes makes about as much sense as slapping a surcharge on bus fare or bicycles to fund rebates for hybrids. So what kind of incentives would work to increase the fleet's fuel efficiency? Feebates. Gas (or carbon) taxes. Pay-As-You-Drive insurance. Blah, blah, blah. Plus, lots of other stuff that would help make driving a choice, not a necessity. Apparently I didn't do such a good job in this post explaining why I found this New York Times article on higher-mileage, gas-electric hybrid SUVs so troubling. So I'll try again. To recap -- the Times article claims that, under the system governing vehicle fuel economy in the U.S., selling a hybrid Escape lets Ford sell an additional Lincoln Navigator without running afoul of federal standards. In other words, while buying an Escape may mean that you're driving a more efficient vehicle, it doesn't mean that the average fuel economy of all the Fords on the road will change one whit. Now, remember, the CAFE standard for light trucks over this period was 20.7 mpg -- that is, the average mpg for all the light trucks that Ford sold had to be 20.7 or more, or the federal government would levy a fee on each vehicle. From the numbers, it's pretty clear that Ford has been doing its level best to keep its light truck fleet at or near 20.7 each year -- maybe a little above or below, but not enough to incur any penalties (under CAFE rules, exceeding the standards in one year lets you dip below them in subsequent years). So how does the company fine-tune its vehicle sales to fall right at the CAFE standard? By tweaking its pricing, offering deeper discounts to ramp up sales of higher-mileage pickups and SUVs, while still selling as many hulking SUVs--vehicles with terrible gas mileage but huge profit margins--as it can without running afoul of the standards. My point here is that the introduction of the 35 mpg Escape, by itself, probably doesn't change this dynamic. Ford is legally required to maximize its profit -- otherwise it faces the threat of a shareholder lawsuit. So it's got an incentive to use whatever means it can to keep the high-profit SUVs moving off the car lots. And that means that selling more Escapes won't necessarily boost the overall efficiency of the vehicles Ford sells. 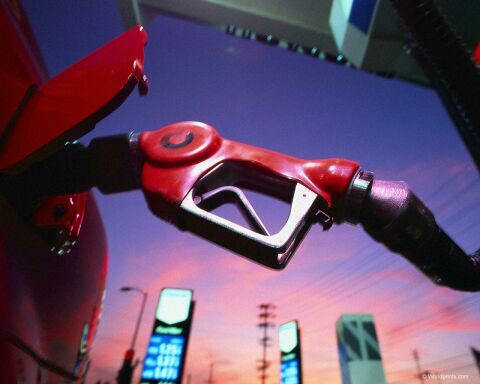 Higher gas prices might boost fuel economy; stricter standards might as well. But as nifty as the high-tech hybrid Escape may be, buying one won't guarantee that Ford's overall mileage is moving in the right direction. Obviously, the existence of the Escape has spinoff benefits. Among them, it undercuts the car-makers arguments that major improvements in vehicle efficiency are technically impossible. Hybrid SUVs show that the feds could probably lift CAFE standards for light trucks above 30 mpg without forcing automakers to do much, if any, R&D. True, the big auto manufacturers could always say that they can't afford to make trucks more efficient. But they can't say that they don't know how. So, all this goes to say that a system can have unpredictable results that undermine the best intentions of any one individual. That's not a reason to throw up one's hands in despair -- but it is a reason to think that changing the system is even more important than making the right kinds of purchases. Of course, this is based on partial-year data for 2005; actual consumption for the year may be a bit higher (because of a strong economy) or a bit lower (because of high prices). But even if 2005 proves to be a bit higher than 1998 in the final analysis, it's still a surprising trend. With the exception of the oil crisis/recession of the late 1970s and early 1980s, gas consumption has grown pretty consistently since the 1950s. And per capita consumption of gas had barely budged since the early 1980s -- our consumption has been tightly correlated with total population growth. But if these numbers are right, we're starting to see some concrete signs that high prices are begininning to bite. From 1999 through last year, average per-capita gas consumption throughout the region fell by 7 percent. That's not a huge amount, mind you. But it's something. It's too early to tell whether that trend will continue--whether we'll continue to be able to add new residents without increasing our total consumption. I doubt it. Still, the little flat part to the right of that graph gives me some reason to be hopeful.